The Ambient Pressure Surface Characterization Laboratory (APSCL) has unique capabilities for preparation and characterization of samples in a range of environments. The capabilities are housed in Johnson Hall and includes microscopy, spectroscopy, and diffraction. Users can be trained to use the equipment for independent research projects or staff members can assist or perform the analysis for you. The APSCL has two main instruments which can be used for a range of surface characterization measurements. 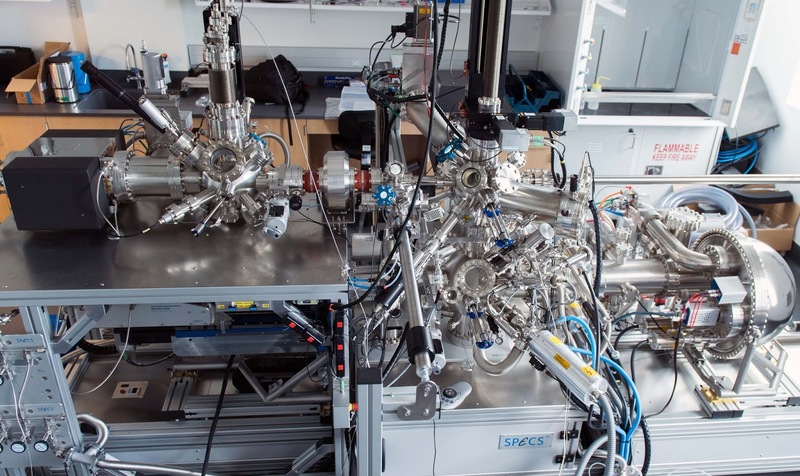 The primary capabilities are X-ray photoelectron spectroscopy (XPS) and scanning tunneling microscopy (STM). • Analysis pressures from near ambient pressure (25 mbar) to ultrahigh vacuum (UHV). • Monochromatic Al Ka (hv = 1486.6 eV) for using in UHV and ambient pressure cell. • Non-monochromatic Zr Mg (hv = 151.4 eV) | Ag La (hv = 2984.3 eV) for UHV. • UV lamp (hv = 21.2/40.8 eV) for UHV. • Ion gun for sample cleaning and ion scattering in UHV. • Low energy electron flood gun for charge compensation. • In-situ sample cooling and heating from 120 to 1073 K (UHV) and 200 to 873 K (25 mbar). • Typical sample size < 10 mm x10 mm and 1 mm thick. • Polar and azimuthal rotation. • Imaging from ambient pressure (100 mbar) to UHV. • In-situ sample cooling and heating from 220 to 773 K (UHV) and 298 to 523 K (10 mbar). • Low energy electron diffraction with Auger electron (AES) and electron energy loss spectroscopy (EELS) capabilities. • In-situ sample cooling and heating from 120 to 1073 K (UHV). I manage the interface and surface science tools in the CBEE department at Oregon State University. Please contact me directly for information about using any of these research capabilities. • 03/11/2019 - Chemical Engineering Master Defense, by Shane Lorona "Investigation of the initial stages of SiGe(001) dry thermal oxidation using ambient pressure x-ray photoelectron spectroscopy"
• 10/31/2018 - Final Oral PhD examination of Christopher M. Smyth. Dissertation title: Characterizing and Engineering the Metal Contact Interface in 1D and 2D Chalcogenide Systems. © Dr. Rafik Addou - September 2018. Awesome Inc. theme. Powered by Blogger.